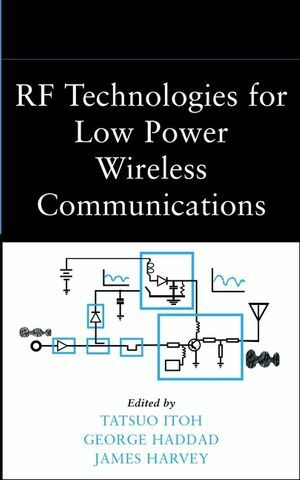 RF Technologies for Low Power Wireless Communications updates recent developments in wireless communications from a hardware design standpoint and offers specialized coverage of microwave technology with a focus on the low power wireless units required in modern wireless systems. It explores results of recent research that focused on a holistic, integrated approach to the topics of materials, devices, circuits, modulation, and architectures rather than the more traditional approach of research into isolated topical areas. With a clear focus and expert contributors, RF Technologies for Low Power Wireless Communications will be of interest to a wide range of electrical engineering disciplines working in wireless technologies. TATSUO ITOH, PhD, is Professor in the Electrical Engineering Department at UCLA. He has published several hundred book chapters and journal articles and is also editor of Numerical Techniques for Microwave and Millimeter-Wave Passive Structures and Finite Element Software for Microwave Engineering (both from Wiley). GEORGE HADDAD, PhD, is Professor of Electrical Engineering and Computer Science at the University of Michigan. He has authored numerous publications in the areas of solid-state microwave devices and circuits. JAMES HARVEY is a Research Program Manager at the Electronics Division, Army Research Office, with primary responsibility for the fields of electromagnetics, antennas and antenna structures, innovative microwave and millimeter-wave circuit integration, low-power/minimum-power system design, and landmine detection. Introduction (James F Harvey, Robert J. Trew, and Dwight L Woolard). 1. Wireless Communications System Architecture and Performance (Wayne Stark and Larry Milstein). 2. Advanced GaAs-Based HBT Designs for Wireless Communications Systems (M. Frank Chang and Peter M. Asbeck). 3. InP-Based Devices and Circuits (Dimitris Pavlidis, Donald Sawdai, and George I. Haddad). 4. Si/SiGe HBT Technology for Low-Power Mobile Communications System Applications (Lany Larson and M. Frank Chang). 5. Flicker Noise Reduction in GaN Field-Effect Transistors (Kang L. Wang and Alexander Balandin). 6. Power Amplifier Approaches for High Efficiency and Linearity (Peter M. Asbeck, Zoya Popovic, Tatsuo Itoh, and Lany Larson). 7. Characterization of Amplifier Nonlinearities and Their Effects in Communications Systems (Jack East, Wayne Stark, and George I. Haddad). 8. Planar-Oriented Passive Components (Yongxi Qian and Tatsuo Itoh). 9. Active and High-Performance Antennas (William R. Deal, Vesna Radisic, Yongxi Qian, and Tatsuo Itoh). 10. Microelectromechanical Switches for RF Applications (Sergio P. Pacheco and Linda P. B. Katehi). 11. Micromachined K-Band High-Q Resonators, Filters, and Low Phase Noise Oscillators (Andrew R. Brown and Gabriel M. Rebeiz,). 12. Transceiver Front-End Architectures Using Vibrating Micromechanical Signal Processors (Clark T.-C. Nguyen).